which have been launched from the surface Mars by an asteroid impact. The mean distance between the Earth and Mars is approximately of 78,300,000 km, that is, roughly half the distance from the Earth to the Sun. As compared to the Moon, which is some 380,000 km away, Mars is at appr. 200 times the distance. Among the 27000 meteorites known on earth to date, only 33 were torn off on the surface of Mars by violent impacts. These specimens are such the rarest matters on Earth. have always been the most desired meteorites for collectors and are also some of the most valuable. How do we know these Mars Meteorites are from Mars? Science is almost certain the SNC Group of meteorites derived from Mars because of their young ages, basaltic composition, and inclusion of gases with the same composition as the Mars atmosphere. Composition of gases of Mars meteorites are almost identical to those of samples tested on the Mars surface by the Viking probe. From which region on Mars did these meteorites come from? The majority of shergottites seem to have a crystallization age of ~175 Ma, while others have ages of 330 to 575 Ma. The Shergottite group defines a big variety of scientifically interesting igneous samples from Mars. All are roughly built up by basaltic compositions and mineralogy but the isotopic compositions and trace elements cover a larger diversity. A Mars Meteorite of about 40lb fell about 0.75 miles from Zagami Rock, Nigeria. 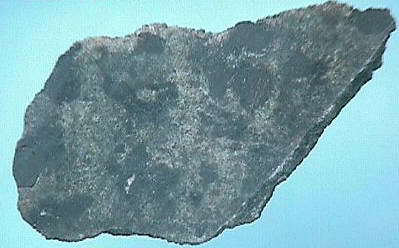 One fresh Mars Meteorite covered with almost 100% complete fresh black fusion crust was discovered on June 17th 2000. It turned out to be one of the most interesting and unique meteorite discoveries ever. Dho 378 is only one of four Calcium poor Martian Meteorites in the world (beside ALH84001, Chassigny, and NWA 998) . Due to the presence of titanomagnetite the Dhofar 378 belongs to the rare titanomagnetite-bearing basaltic shergottite group. intercrustal magmatic differentiation process on Mars and give hints for potential mining (Ti) missions on Mars. The high Fs content of the pyroxenes(Fs 40 to 93) and the high proportion of feldspar suggest that Dho 378 is a late Martian magmatic differentiate. Among basaltic shergottites Dho 378 represents the most evolved Martian magmatic liquid composition. (what recrystallization of various plagioclas segments seem to confirm). silica, titanomagnetite, ilmenite, sulfide, phosphate, and rhyolitic glass as the main minerals. proved that heavy fractionation occurred on Ne isotopic composition in Martian atmosphere. In terms of mineralogy Dhofar 378 is more similar to LA 001/002 than to other members of shergottite groups. CRYSTALLIZATION EXPERIMENT; IMPLICATIONS FOR THE CRYSTALLIZATION OF LOS ANGELES 001 AND DHO 378. Similar to Los Angeles the Cr is very low. Dho 378 is the first shergottite with a positive Eu anomaly. which controls the bulk rock REE concentrations. of whitlockite is high enough to compensate the positive Eu anomaly of maskelynite. Only in Dhofar 378, with about 50 times more plagioclase glass than whitlockite, we observe a positive Eu anomaly. to be from Mars. Note it was previously analyzed by otherwise excellent scientists by mistake as terrestrial lava Xenolithe (I will call no names! ), as the material looks indeed intriguing. tiny complete slice 0,073g, 13x8.5mm US $500 sold! location of find is unknown. It is a basaltic shergottite - the texture is similar in appearance as Shergotty & Zagami. pockets with phenocrysts and submicron-sized needles of stishovite are present. From which region on Mars did this meteorites come from? This basaltic shergottite belongs to the Olivine-orthopyroxene-phyric Group. The DAG 735 is the first ( found already 1997) and such the first and "original" Mars meteorite found in the Sahara! in a finer grained matrix of pigeonites (Fs 25-28) and feldspar glass (An 65). A direct comparison with a PTS of DaG 476 shows that both Mars Meteorites are very similar and most probably paired. 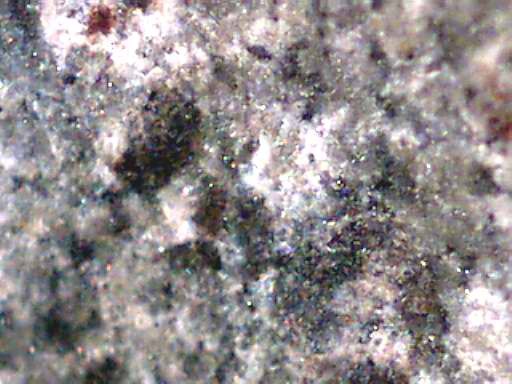 An exception is that this Mars Meteorite does not contain terrestrial carbonate veins, it appears less weathered than DaG 476/489/670. This meteorite is a Shergottite and is part of a group of meteorites called the SNC's standing for Shergottites, Nakhlites and Chassignites. This gemmy Mars Meteorite consists primarily of olivine, chromite, pigeonite , augite, orthopyroxene. 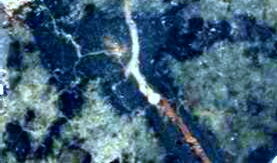 It contains magmatic inclusions within the olivine. These consist dominantly of pyroxenes and feldspathic glass. The olivines have the range Fo 60-62 (phenocrystic olivine ranges from Fo 78 to Fo 59 (Ikeda). Yukio Ikeda: Unusual inclusions occur within olivine megacrysts in the DaG735 olivine-phyric shergottite. 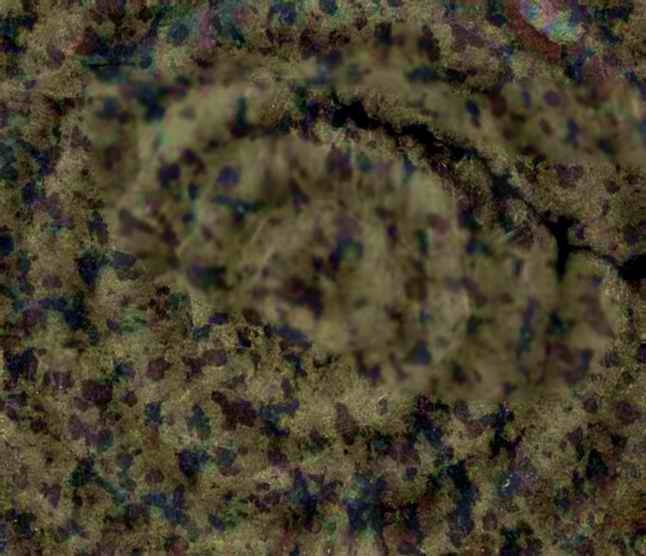 They consist of pyroxene and chromite in a ratio of about 2:1, and show strange textures. They are grouped into two types, symplectic and non-symplectic. which are lower by half than those of chromites in the main lithology. Studies of the thermal history of this rock (e.g. rapid cooling rate of the melt) suggests that this material originates from an extruded lava flow near the Marss surface. Top condition! The mars meteorite comes with certificate. It comes with a decorative certificate of authenticity! 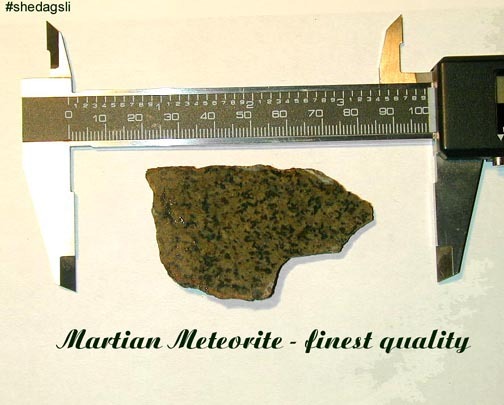 One Mars Meteorite weighing 2015g was found 1st of May 1998 in DaG in the desert , Shergottite. DaG 1037 is not only one of world's biggest mars meteorites it is also special because it is the missing Shergottite link from Mars! Opx is occuring as cores in prismatic pyroxene phenocrysts! The olivine is of different appearance in DaG 1037 and reveals that it was extremely heavy exposed to a major impact shock event on the Red Planet. The numerous impact shock veins, Melt veins + melt pockets suggest that this specific rock material was exact the zone on Mars that was hit by the asteroid that caused the material to leave Mars! It is very fresh material! Nine stones of aTkW of 4010g were found early 1999 in the sand desert of DaG, within a few feet. The biggest individual was a complete individual of 3090g, with perfect orientation and fresh appearance. The name Shergottite describes interesting meteorite material that originated from Mars .Mars meteorites have been launched from the surface of Mars by an asteroid impact. The SNC's have always been the most desired meteorites for collectors and also some of the most valuable. This gemmy stone consists primarily of olivine, chromite, pigeonite , augite, orthopyroxene. Although this material looks optically different than the DaG 476, 489, etc. 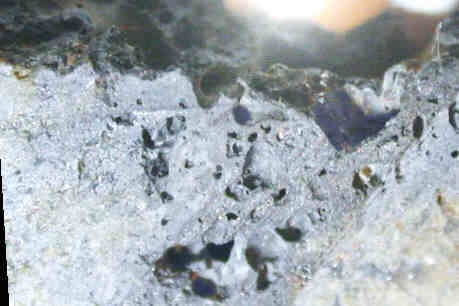 (more glassy texture, large vesicles of up to 12mm with walls of black silica glass) this material is very likely paired with this olivine-phyric shergottites group. Extensive searches over a long period of time by different groups in later years for this material in this area (DaG 476, 489,DaG735.... DaG 1037) didn't yield any further stone. It is probably paired with DaG 735. 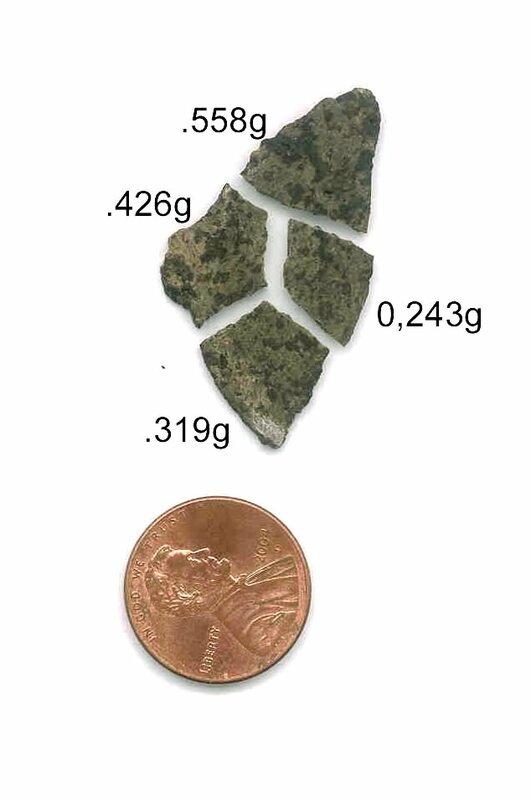 It petrographically resembles other olivine-phyric shergottites such as DaG 476, SaU 005, Dho 019, and NWA 1068.
thin complete/ part slices with/without crust. Let us kindly know which price/size range you might be interested in! Two stones (414 and 383 g) were found in the Atlas mountains (Morocco) in 2001.
material is a cumulate peridotitic rock consisting of olivine (~ 55 vol%), low and high-Ca pyroxenes (~ 35 vol%) and plagioclase glass (~ 8 vol%). thin complete/ part slices Let us kindly know which price/size range you might be interested in! hard to get although paire to SaU 005 et al! The Main Mass is in possession of La Benes Meteorites. We got a small amount of the excess material (which was given originally as the deposit material for the Verndsky Institute but) later returned to the Original finder. A new small stone of SaU 150 was found in the area of previous shergottit finds. A new small stone of 75 g SaU 120 was found by Russian finders in the area of previous shergottite finds. the SaU 120 is paired to SaU 005/008/051/060/090/094. Ti-magnetite, augite, chlorapatite and sulfide. Olivine has cores of Fa31.7 (FeO/MnO = 50-54.5) and rims of Fa50.3 (FeO/MnO = 54-57). If you are happy with our shipment you can recommend your satisfaction to friends, lists or forums. Thank you very much! We reserve the right to refuse to sell to individuals or groups with giving reasons! Please mark as bookmark since this page is frequently updated; Thank you!